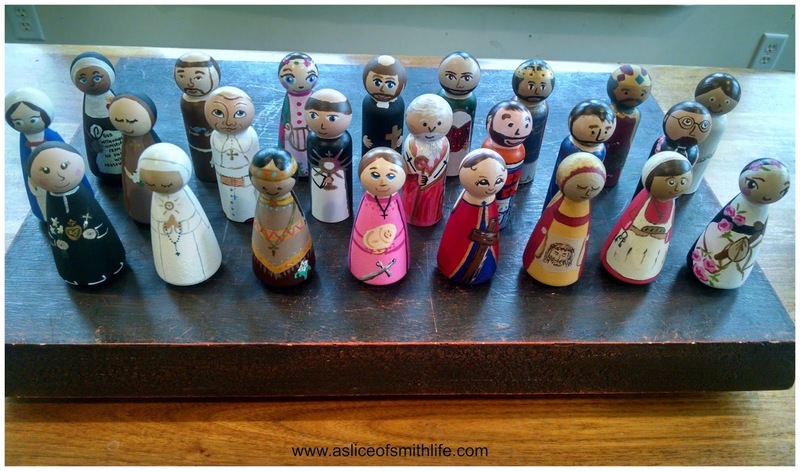 A Slice of Smith Life: My First Saint Peg Doll Exchange: What Fun! 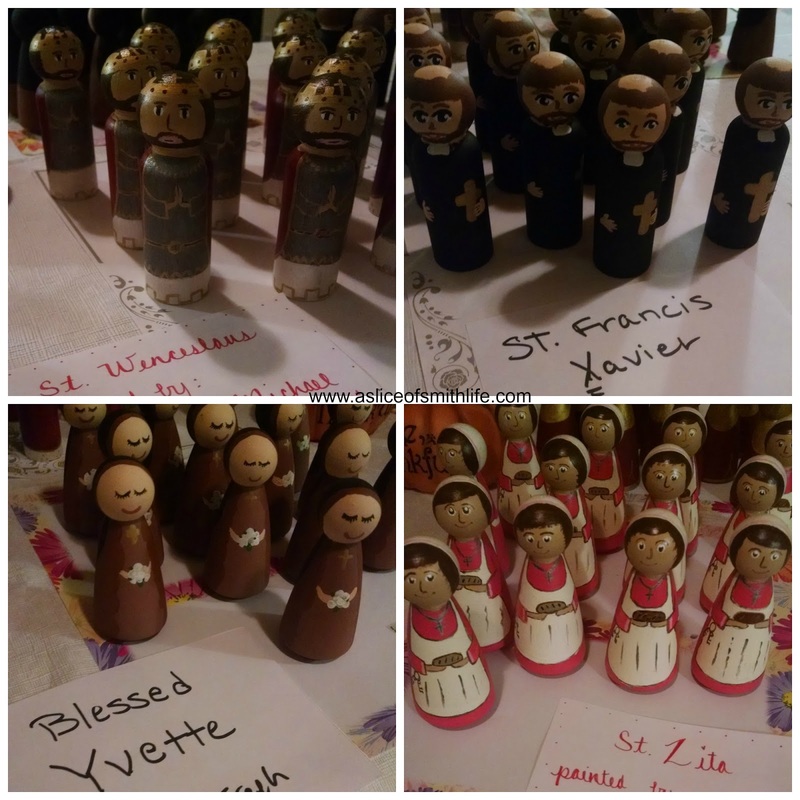 This past weekend, I participated in my first Saint peg doll exchange! 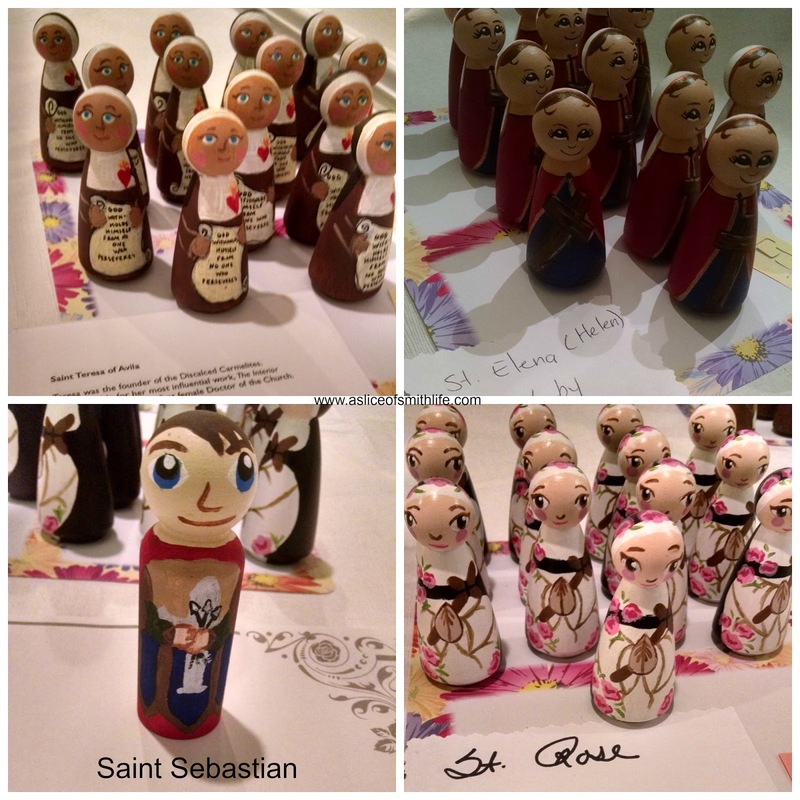 What a blessed adventure it was to paint depictions of Saints on 3.5 inch wooden dolls! So what's a Saint peg doll exchange you may ask? For our group's exchange, we each picked 2 letters of the alphabet and painted 2 different Saints that began with the chosen letters. So I chose the letters "K" and "L" and decided to paint Saint Kateri Tekakwitha and Saint Luke. 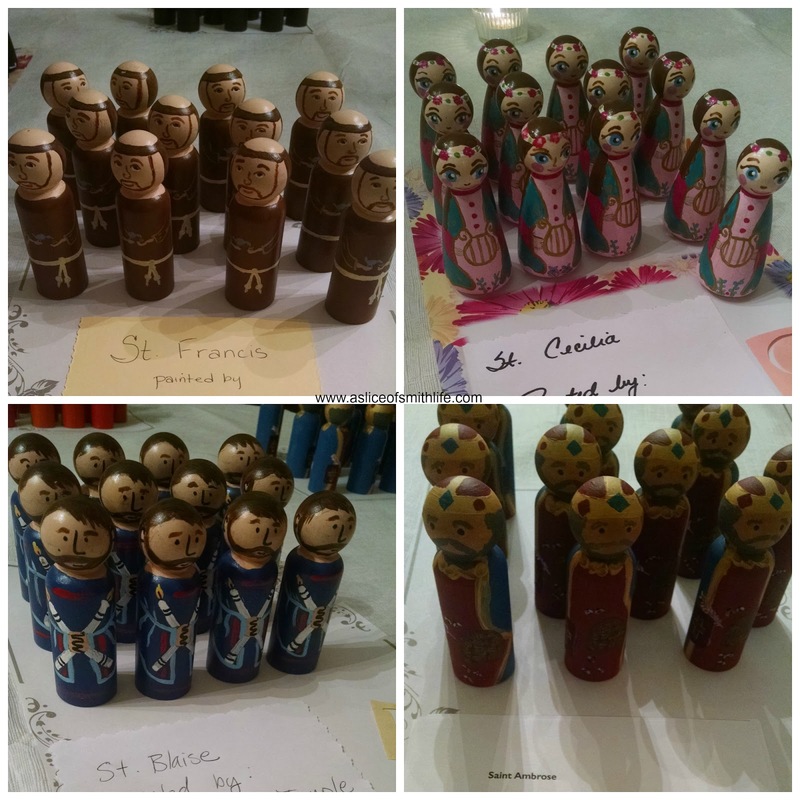 I painted 13 of Saint Kateri and 13 of St. Luke ( I actually painted 15 St. Luke dolls to give the extras as gifts for friends). 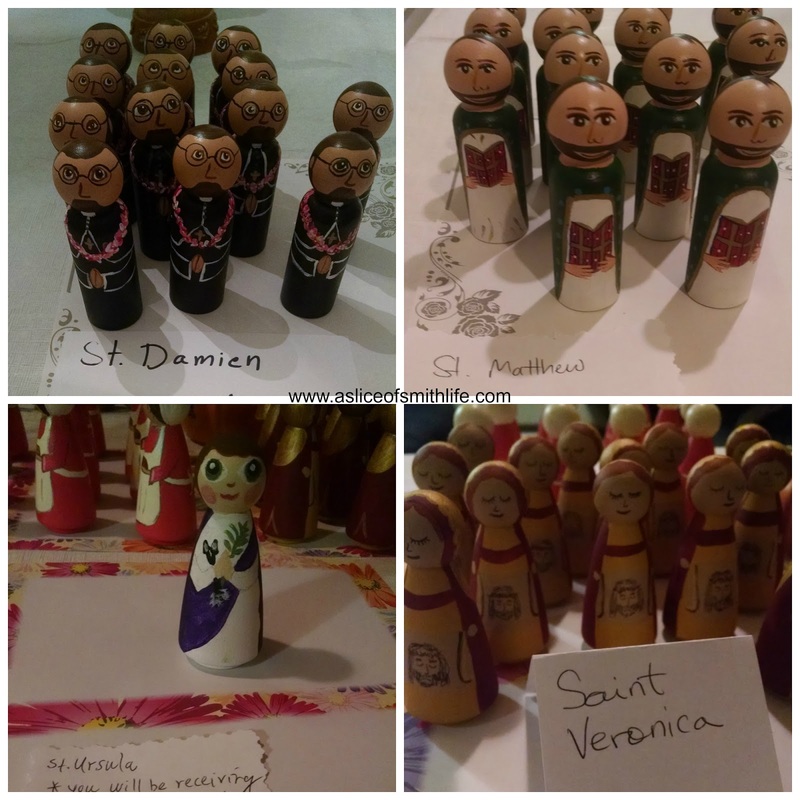 Then all the ladies in the group exchange met this past Sunday night and we swapped Saints so that each of us went home with 24 different, beautiful Saint dolls and then I kept 1 Saint Kateri doll and 1 St. Luke doll that I painted. 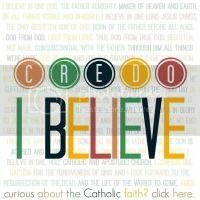 I received an email from my friend Trish back in late July and she asked me if I wanted to take part in this exchange. I'd heard of Saint peg doll exchanges for some time now from fellow bloggers and I thought I'd love to try out this type of creative outlet someday. I'm so glad I did it! 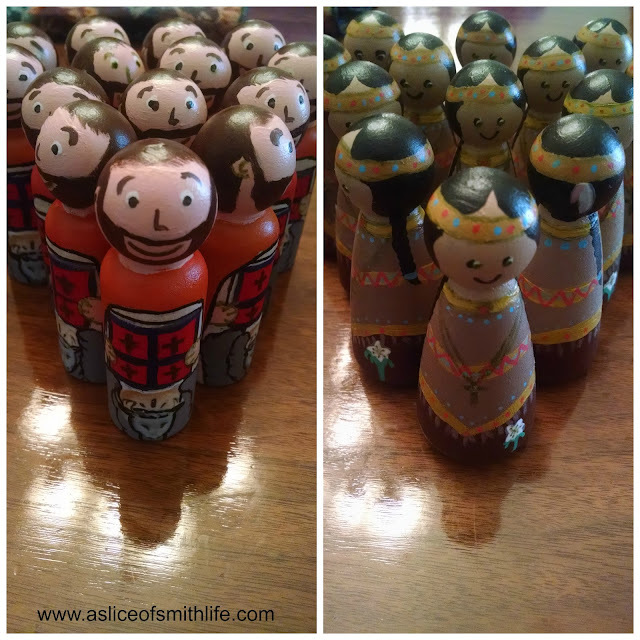 After I decided which Saints I would paint, I then searched the internet for Saint Kateri and Saint Luke so that I could get an idea of even where to begin. I knew I couldn't design the dolls myself so I was relieved to find a Saint Kateri doll and Saint Luke doll in Etsy shops to use their designs as a much needed guide. 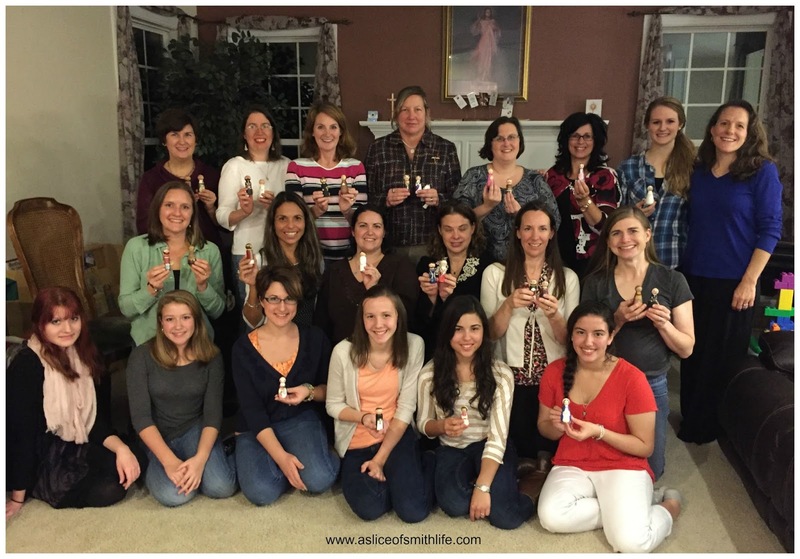 Here are the dolls I painted into the wee hours of the morning for several nights. 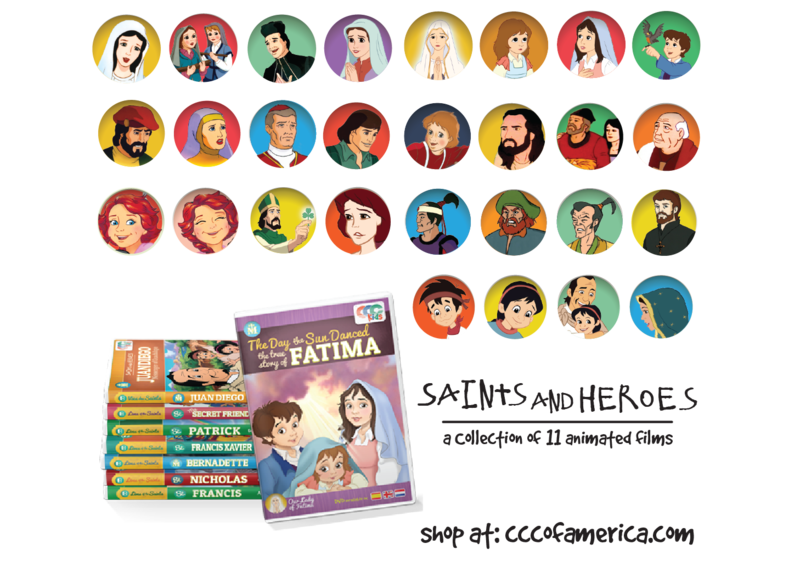 Introducing St. Luke and St. Kateri! Before we ate and had the exchange we opened the evening in prayer and then took a group shot with everyone holding the dolls they painted. I was blessed to have my mother (not pictured) make the out of town trip with me to meet up with these wonderful and creative ladies. 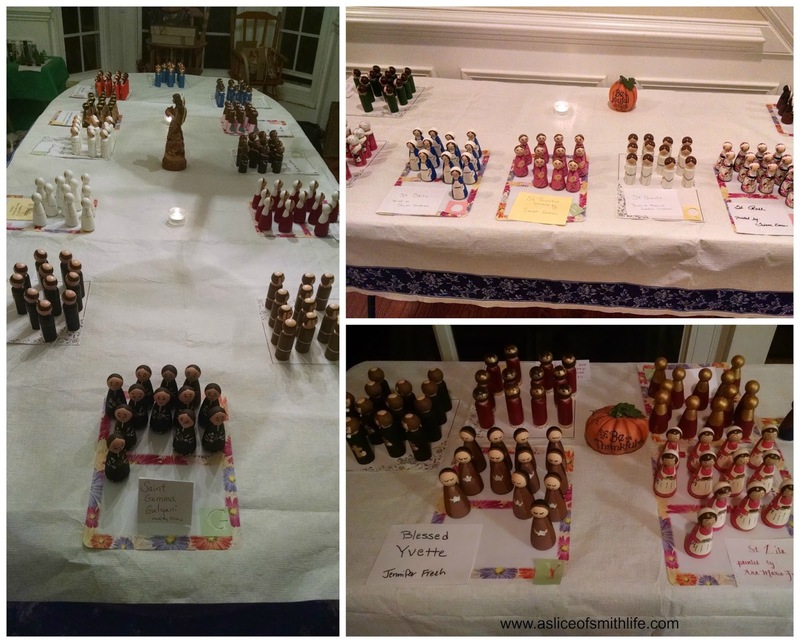 I look forward to displaying these dolls for feast day celebrations like at our annual All Saints Day party next year. Here's the line up of Saints. 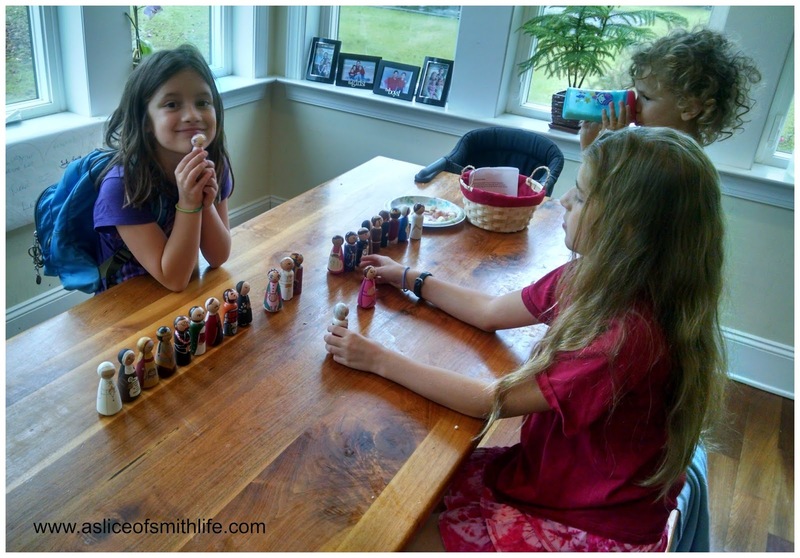 Today some of my children were playing with the dolls and my 7 year old daughter exclaimed, "I love these dolls Mom! 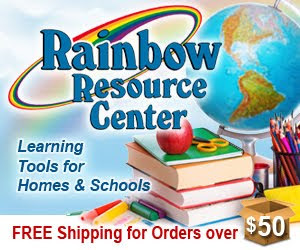 They are fun to play with!" :) And I couldn't agree with her more! I hope these Saint dolls will be another wonderful reminder for my children of how blessed we are to know, love, and serve God through the beautiful witness of the communion of Saints! 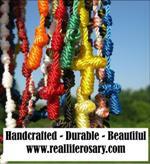 Have a blessed week and all the Saints, pray for us! SO gorgeous! What talent your group had!!! I LOVE them! 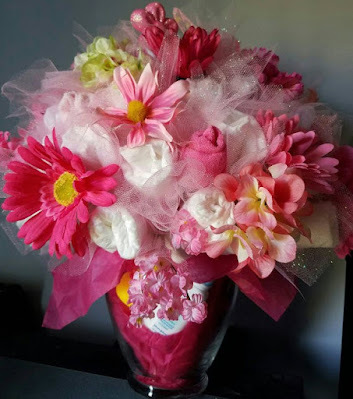 I did an exchange recently, too, and blogged about what NOT to do, since, being creative but not crafty, I made sundry mistakes. LOL. Patty, that's great! 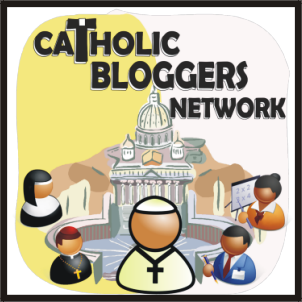 Have a fun and blessed time! Revisiting your post. 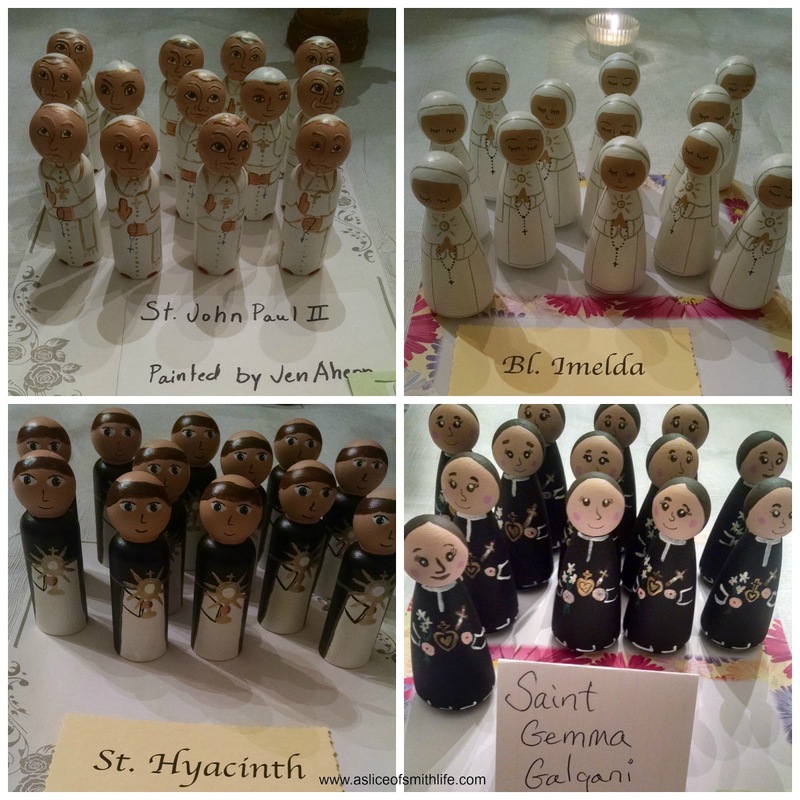 Such LOVELY saints. What a truly talented group of folks you exchanged with. 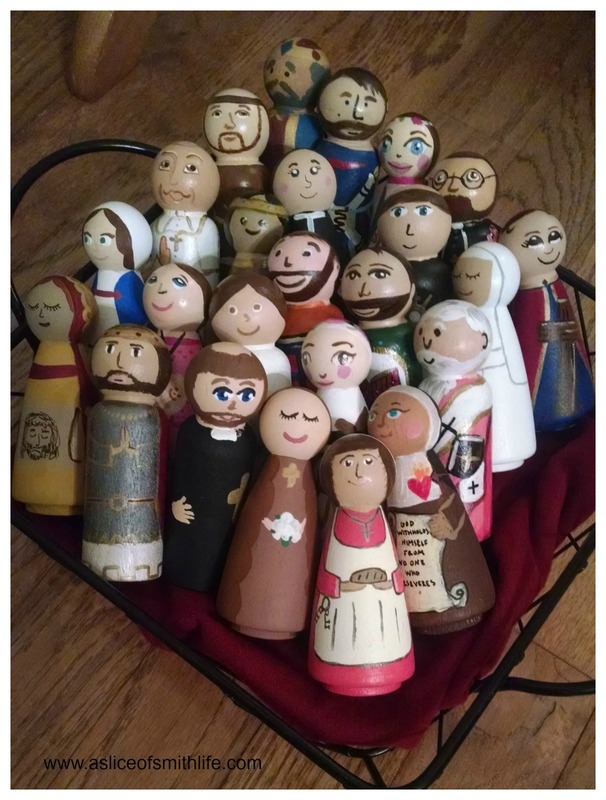 And, how did you manage to paint the St Luke doll's bottom so well? Is it free hand or a modge podged picture? (My son is a Luke and he wants a St Luke doll, so I am thinking of designs...) Has the varnish you used held up? I have found modge podge gets tacky and am trying to find the "best" coat to seal/reseal some dolls with. Hi again Martianne! Thanks for the revisit! 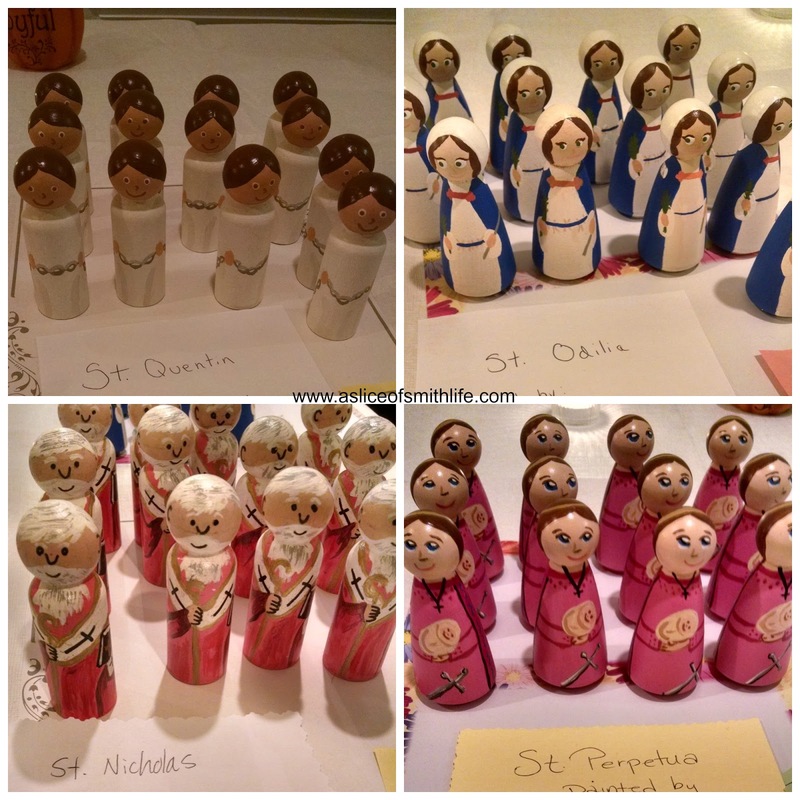 For the St. Luke doll I didnt hand painted the ox and wings at the bottom because I knew that would be over my head! So I printed out the St. Luke doll from Etsy link (link is in the post), copied it to a smaller size to then cut and mod podged the ox and part of the wings to the doll. Then I painted over the parts of the copied wings to make the wings out of paint. Hope that makes sense! And yes, the varnish I used is working well still.